Well, fall is in full swing. The wind is picking up, the leaves have for the most part fallen and we just saw the first hint of snow. Yikes. It is not so bad outside as usually I am fairly prepared and properly dressed for it but what do you do when the breeze is blowing inside too…..? Now I know you read last month’s blog and have rushed out to insulate your attic. Good move. Heat rises and if there is no barrier then it will just keep on rising right out of your roof and leave those deadly icicle daggers behind. Nobody wants that. Still feel a breeze? Check your walls. If you live in an older home (I am looking at you quaint turn of the century farmhouse owners) then you may want to check them twice. You see as time goes on insulation (like everything else) settles. It sags and compacts and likely it was never up to current code, to begin with. That means that you may have great protection at the baseboards but nothing around the crown moulding. I am sure you can see the dilemma there. At this point, you have to consider your options. You can rip down all your walls, remove the old stuff and put in new insulation. You have many great options there; you can choose Spray foam for those tight corners, Roxul batt for soundproofing, or even the traditional Fiberglass batt. Not interested in completely remodelling your home? No problem. Cellulose is your answer. We will come in, make a few small holes in your exterior walls and fill them up with insulation….wonderful energy-saving insulation. Then we plug up the holes and after a little touch-up painting, you’ll hardly be able to tell we were there at all. 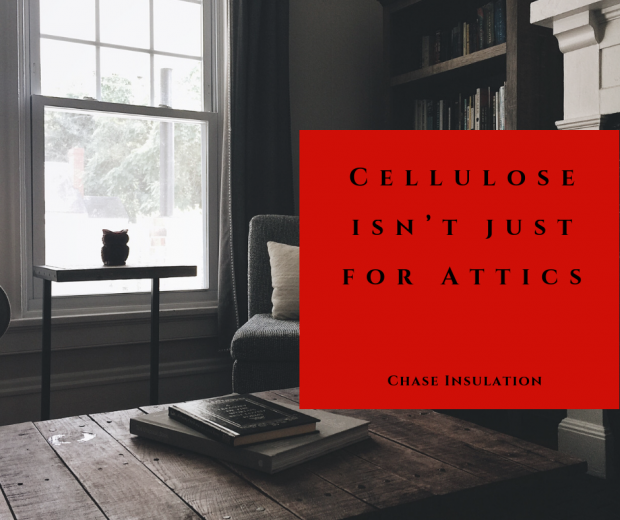 In case you missed my last post (and if you did you really should go back and check it out) I review some of the specifics regarding cellulose and why you should consider topping up your walls with it. Cellulose is made up of recycled paper, usually newspaper and is then treated with boric acid and borate. The recycled paper aspect is super eco-friendly and the treatment of said paper leaves it flame, pest and mould resistant. Borate is actually a class 1 fire retardant. That means that if your house were ever to catch fire it would take longer for the fire to spread if the walls and attic are insulated with cellulose which ultimately could prevent the fire from spreading to neighbouring buildings. It really is a great product. Cellulose is practical, cost-effective and has a great R-value. It can conform around obstructions like wires and ducts and it is relatively easy to install. If you want to read more about it please consider checking out our products page or better yet just give us a call. We are always happy to talk shop with friends and neighbours. If you live in Southwestern Ontario then we are glad to serve you and help you keep old Jack Frost out in the yard where he belongs. Contact the team at Chase Insulation today.